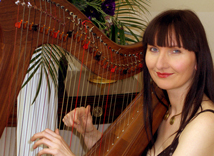 Ramona is an accomplished, professional harpist and has been performing for over twelve years. She studied with renowned classical harpist Mary Morley. 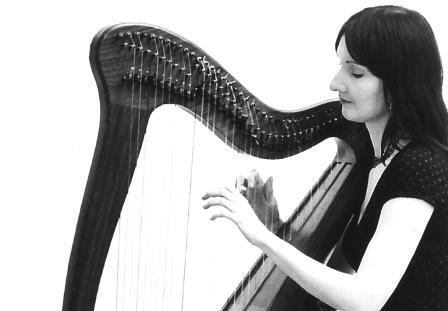 Her repertoire includes Irish, English and French music and features pieces by the most revered of Irish harpists: Turlough O'Carolan, whose music embodies the perfect marriage of Classical and Celtic styles. Much in demand playing for weddings and events throughout the UK she travels extensively, performing in many stunning venues including: Leeds Castle, Chewton Glen, Lympne Castle, Caverswall Castle, Whitstable Castle, Mount Ephraim, Fort Amherst, Salmestone Grange, St. Augustine’s, Carey’s Manor and Eastwell Manor to name but a few. She has wide experience of playing for many occasions including: receptions, weddings, civil partnerships, handfastings, birthdays, anniversaries, garden parties, corporate events, welcoming ceremonies and funerals. She also performs for concerts, cultural events, storytelling workshops, residential homes and teaches privately. Ramona's Celtic Harp is said to be the most romantic and intimate type of harps. It is a 'clarsach' type made by Pilgrim Harps and has a full, sweet tone. Ramona is frequently requested to sing whilst accompanying herself on harp. She also occasionally performs with string quartets and guitarists. For information about wedding packages available please visit the wedding page. To make an enquiry or to discuss your musical requirements please contact Ramona. Just wanted to say a huge thank you for coming and playing at our wedding ceremony back on the 18th May, Everyone commented on how lovely your playing and singing were, it was beautiful, Thank You! I think there are no words to express our gratitued for your wonderful performance and the atmosphere you helped to create on our special day. We kept you as a surprise for our guests which was much loved by everybody. Dear Ramona, Just a quick note to thank you so much for your work on Saturday afternoon and our wedding. Although we spent so little time in the reception room, we were occasionally aware of the gentle, discrete harp music which was perfect for the occasion. We had the most amazing day and your part in it played a very special part, particularly with the first dance.